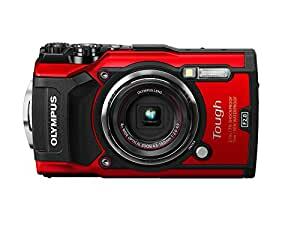 The Olympus Tough TG-5 is built for adventure and packed with professional features that help you nail bright, crisp outdoor shots even in challenging conditions. You’ll find imaging firepower that’s optimized for shooting action like a fast F2.0 Olympus lens, high-resolution RAW stills, and spectacular Ultra HD 4K video. Microscope Macro Modes shoot high magnification stills of small subjects up to 1 cm from the lens, and nighttime Live Composite Mode makes it easy to shoot incredible cityscapes and star trails. Action Track Sensors record location, temperature, direction, and altitude data that bring your images and video to life. The Tough TG-5 is waterproof, shockproof, crushproof, freeze proof, dustproof, and features Anti-Fog Dual Pane Lens Glass. No other camera handles so much abuse while producing stunning photography like the TG-5.